A 15-year-old girl who was brutally beaten inside a McDonald's restaurant in Brooklyn, N.Y., has refused to speak with police about the attack—which happened Monday and went viral after footage was loaded to Facebook. She apparently fears retaliation from the girls, who police believe to be members of a gang called the Young Savages. According to the New York Daily News, the young woman, a student at Erasmus Hall High School, suffered two black eyes and multiple bruises from the attack, which came from at least four girls who punched and kicked her for several minutes while a crowd cheered them on. The Daily News notes that the girls may never be charged in the attack because witnesses are also refusing to talk with police, who noted that they received no calls from anyone other than McDonald's employees that the attack was even happening. "We are asking that young lady to not be afraid," community activist Tony Herbert said on Wednesday outside the McDonald's where the girl was attacked, the Daily News reports. "Come forward. We will stand with her." According to the Daily News, the attack occurred around 2:50 p.m. shortly after school dismissal. The video shows the victim throwing the first punch, but shortly afterward she was swarmed by as many as four young women. 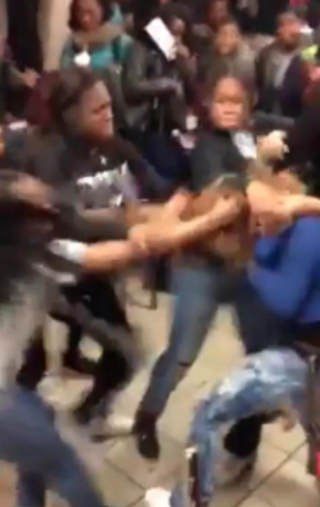 At one point the girl can be seen trying to hide underneath a table, but to no avail, as the girls continued to kick and punch the 15-year-old. At one point someone off-camera can be heard shouting, "Yo, she's dead. It's a murder!" The teen's grandmother told the Daily News that the girl was rushed to the hospital on Monday and was kept overnight and that the teenager has been having trouble sleeping since returning home. On Wednesday, two days after the attack, the girl was rushed back to the hospital after she collapsed. Police told the Daily News that both the girl and her mother are refusing to talk to the police, who are hoping that the girl's father will talk her into cooperating with authorities. According to police who spoke with the Daily News, there is an ongoing beef between the victim and another girl over gossip. They had agreed to meet at the McDonald's to settle the score. "[The victim] was there to fight," a police source told the Daily News. "It looks like they went there to straighten out their differences, and she wound up getting the worst of it." "At first she was fighting just one girl," 15-year-old Tiana Smith, who witnessed the melee, told the Daily News. "Then, like, about eight to 10 others joined. It looked like 100. I felt bad for her. No one was helping her. It was messed up. Not even the adults [helped her]. "I wanted to help her, but I knew I would get jumped, too," Tiana said. Warning: This video contains disturbing images and NSFW graphic language.